Winchelsea Shire (1864-1994) extended along the southern coastline west of Melbourne from near Aireys Inlet to a few kilometres beyond Lorne. It extended inland beyond the Otway Ranges, northwards to the edge of Inverleigh and had an area of 1294 sq km. It was bisected by the Princes Highway and the West Coast railway, through the town of Winchelsea. Smaller towns included Birregurra and Deans Marsh. When first formed, the shire’s access to Lorne was by a road across the Otways through Deans Marsh. The coastal Great Ocean Road was constructed during the 1920s. Winchelsea shire was proclaimed on 27 May 1864, as successor to a Road District (1860). Winchelsea was the administrative centre, and had been named when the town was surveyed in 1859, probably after Winchelsea, Sussex, England. The shire’s northern plains had been taken up as pastoral runs during 1837-39. The hilly southern ranges were later taken up by smaller farms, chiefly for dairying. Vegetables are also grown and timber harvested. A railway line looped southwards from Birregurra to Forrest (1891-1957). During the postwar years Lorne and Winchelsea were the shire’s main growth areas. Lorne’s tourism industries grew strongly, although its resident population changed only slightly, and Winchelsea gained rural/residential population in contrast to the usual population decline in rural towns. In 1994 farming occupied 48% of the shire’s area, on which 215,000 sheep and lambs, 18,500 meat cattle and 8500 dairy cattle were grazed. Three thousand tonnes of potatoes were also grown. 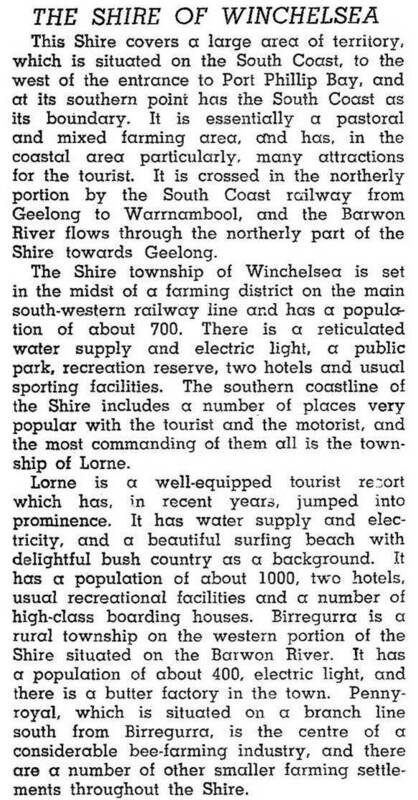 On 9 March 1994, Winchelsea shire was united with Barrabool shire to form Surf Coast shire.